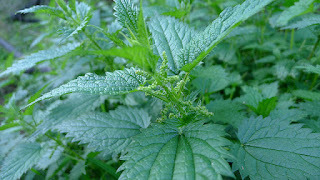 When we were children, nettles played quite a big part in our summer lives. We were outdoors a lot, you see, and we lived by the river. Things were lush and green and, in among all the lushness and greenness, there were nettles. “Just stay away from them,” we’d be told but it wasn’t that easy. Footballs careened into them. Right into the centre where sticks could not poke them out. They grew abundantly on the steps down to the water too and we always had to get to the water, even if it meant a sting or two. And it did. It almost always did. Mean a sting or two. Nettle stings are very annoying. Even as I type this, forty years later on, the back of my hand is itching, on the fleshy part to the side of my thumb. I can almost feel the bulbous pink blister rise up in the middle of the widening rash. Whenever the nettles got you, there was a sense of resignation. A giving-up to the hours of itchiness and general discomfort which must inevitably follow. But all was not lost, even after the occasional full length fall into a bushy growth of nettles. There was always a measure. Not an out-and-out cure but a balm of sorts. An easing of the discomfort. There was always the dock Leaves. Whenever I would run to Mum with a nettle sting, she would offer her inevitable mix of sympathy and admonishment. Then she would send me back out to find some dock leaves so that she could make it ‘all better’. We didn’t call them ‘Dock Leaves’ or ‘Dock Weed’ or even ‘Dock’. We called them ‘Dockens’. They always seemed to grow in clumps quite close to the nettle patches. There always seemed to be a Docken when you needed one. The Docken leaves were a cure for the nettle sting. They were laid gently on the sting and sometimes, in extreme cases, they were rubbed a little bit there. After application of the wide green cool leaves, I would have to sit quietly for a while to let them do their work. As with so many things in those fast receding days, there was even a little rhyme to go with the gentle application of the Docken. It was applied, like the leaves themselves without irony or embarrassment. It just was what it was. A balm to the sting. Did it work? In certain ways, I think it did. The application of the leaves, the little bit of attention from busy Mum, the short time out from the intricacies of another day by the river. These things all combined to ease the sting a little. But the actual practicality of the gentle laying on? I don’t think that did much, not in a scientific, chemical, pharmaceutical way. But there’s a little more. Some years ago, as an adult, I managed to sting myself again in some nettles. I was measuring a field or something and there they were, on the untrimmed perimeter, by the fence. They got me. The annoyed resignation came back as if it had never been away. For the next few hours there would be stinging and inflammation and pain. I hunted around and, yes, sure enough, there was some Docken, as steadfastly locatable as it had ever been. I pulled off some leaves, wondered momentarily about how many passing dogs had pissed on them and then, shrugging, sat down on the grass and applied the leaves gently to my scarlet shin. I sat and stared at them as, quite quickly, nothing happened. I thought about it, as an adult this time, not as a rhyme-reciting nipper. I applied a little logic. If there was some benefit to be had from the dock leaf, it could not be gained by simply laying the leaf on the stings. It was all too placid. I took the leaves off again and scrunched them up in my hand, digging my nails into them until small trickles of juice ran out. I then smeared this newly juiced Docken onto the stings, for they were indeed legion. Quite soon, the irritation abated. It noticeably decreased. Was this all in my head or was there something worthwhile in the Dock Leaves after all? An internet search quickly throws up opinions that there is indeed an analgesic quality to the juice of the Dock leaves. As with most things, it wasn’t all old-wives and witchcraft, there was also some modicum of science in there. Doubtless, I could have limped to the chemist shop and found some cream that would have been many times more efficacious. But the nostalgia, the remembering, and fun of healing oneself in the wild. That was so much better. I was thinking about that this week. I don’t know why. Perhaps I saw some nettles out of the corner of my eye somewhere. Perhaps I saw some Docken. Whatever the reason, it struck my that there is perhaps a useful metaphor in the memory of the Nettles and the Docken. In our lives, there are many clumps of nettles and we fall in to lots of them and they sting and they sting. We all have Docken of some sort. Something that eases us when we have been in the nettles. Our own Balm. It might be reading or eating something nice of chatting to a pal. Whatever it is though, it’s probably not enough to lightly rub yourself with your Balm. You have the work it hard and squeeze the best stuff out of it, in order for your Balm to be helpful and restorative. Take me as an example. One of my Balms is writing. Not sharing it or talking about it, just sitting quietly and doing it. Somehow, iteases the sting. So, I have to do it more and harder rather than just brushing against it lightly. So that I can fully reap the benefit. I got stung as a child—of course I got stung (what child hasn’t been stung? )—but when I think back to my own childhood what I remember were heat spots more than nettle stings. I suffered from them terribly. And the treatment was calamine lotion. I’m sure it’s what we used for nettle stings too but that wasn’t the main reason we had it in the medicine cupboard. I don’t know why I suffered so badly as a child but I did. In the summer I’d be covered in them. But they went away. Couldn’t tell you the last time I had even one and it’s not as if I’ve stopped sweating. The thing about calamine is that the relief is partly illusion. After application to the skin the calamine evaporates, which produces a cooling effect that helps distract you from the itch. This sensation also helps relieve sunburn. I think writing can be like that too. It doesn’t help—it’s not curative—but it is a helpful distraction, something to do with your hands, something to focus the mind. Basically occupational therapy of sorts. There’s something just a little more satisfying in a play or a story or a novel than any raffia basket. Maybe somewhere down the line when I’ve run out of words or got bored by them I might enjoy a bit of basket weaving. But not yet.